Lets take a lesson from one of the very best of all time – Raphael. Raphael is not quite as celebrated as Michelangelo and Leonardo, but his skills were out of this world. He’s one of Mayko’s favourite artists to study. 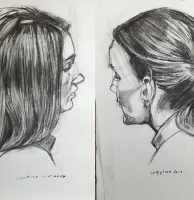 She decided to try to recreate one of this drawings as a way of absorbing more learning from him and getting more insight into what makes his drawings so good. She decided to focus on this drawing, because it’s full of movement and energy. As is often the case, the first challenge is mindset related. “I can’t draw anything like this level, so what’s the point in copying this? 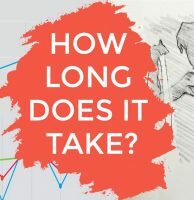 I’m doomed to fail.” And as usual, it’s important to keep in mind our purpose – we aren’t trying to be on par with Raphael or faithfully copy his drawing, we are trying to learn, we are training artistic muscles. Raphael is on many people’s greatest of all time shortlist for line quality, fluency, hatching and movement. There’s tons we can learn every time we do a study of him. 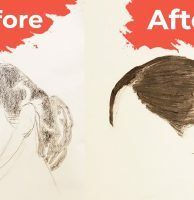 To be honest, if you try to copy his drawings, there’s no way you won’t learn something, so success in this exercise is pretty much inevitable. So ideally we aren’t going to just start mindlessly matching lines like a robot. 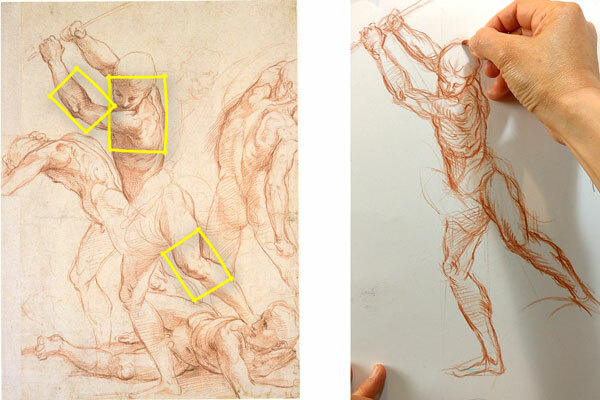 Instead, we could try to recreate the process of drawing this figure like Raphael did. Firstly, assess the pose that he was basing this on. The key is the twist. There’s so much power being built up here in the torso. 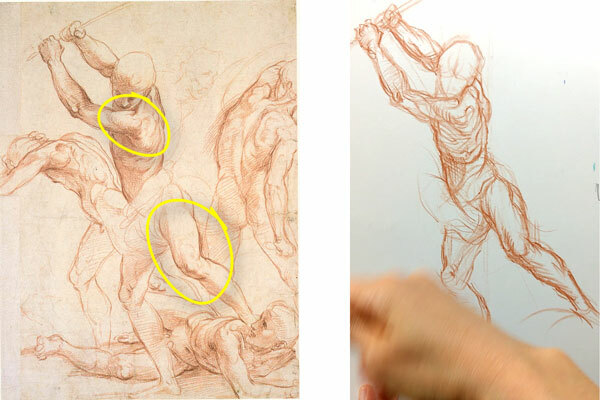 Now, since we are learning life drawing, we might be a little less confident than Raphael. Often, when you’re less confident, you’ll reduce the movement, the angles, the dynamism in a pose. We unconsciously make them more bland because it’s somehow safer. Avoid that by pushing that twist in your drawing, even exaggerate the angles. It would be very easy to reduce the angle between the bulk of the torso down to the pelvis. 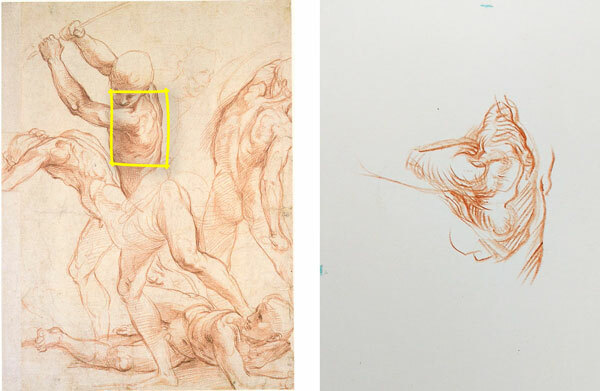 Notice this sharp angle and fight to keep Raphael’s movement in your drawing. The pose is quite balanced, around this leg – that’s his stability. 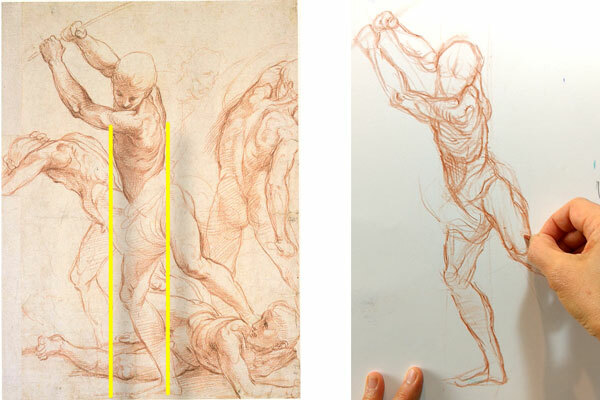 Raphael has taken care over the centre of gravity and balancing the figure over this leg, so we can do the same. This core is a coiled spring full of tension. Around it, there’s the left leg and the arms balancing each other out and adding to the twisting feeling. Gestural drawings feel great when they have a lot of movement around a sense of stability. Lets look for the big masses in the figure. Blur your eyes a bit and look at what is coming towards us and what is receding. The left leg is coming towards us. The knee having more detail and more contrast helps emphasise that. The left shoulder and shoulder blade are also coming towards us, so we can bring that forward too. They will spin away from us as he brings that stick down. So, emphasising how they are coming towards us helps to enhance the sense of a coiled up spring. Where has Raphael added contrast and detail? He’s bringings our eyes to these areas. They are adding to that twisting movement in the figure, and bringing attention to the tension in the back and shoulders, because the point of the drawing is that they are gearing up for a terrible swing. They are also nicely balanced around that stable centre. 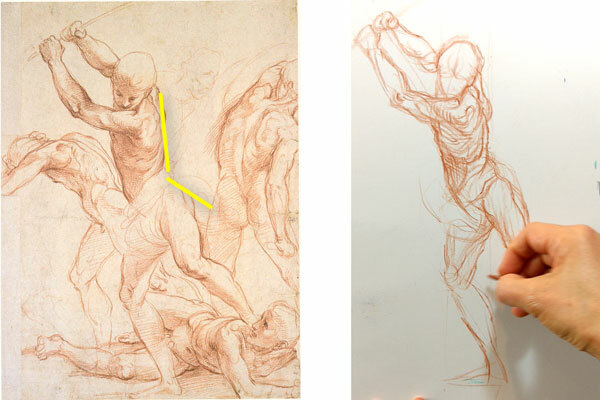 So Mayko got to grips with Raphael’s treatment of the pose in this drawing and we learned a lot. But, there’s another aspect to the original that would be great to learn more about. Look at Raphael’s lines and hatching. They’re fine and elegant but also powerful. She did her drawing at a small scale to fit on the camera, so trying to match his hatching wasn’t possible. To learn more about this beautiful hatching, she’s tried zooming in on one part of the figure – that crucial shoulder and shoulder blade, and try to recreate Raphael’s lines and hatching. The hatching supports the movement of the pose, not just following the contours of the figure, but also reinforcing that twist in the figure. 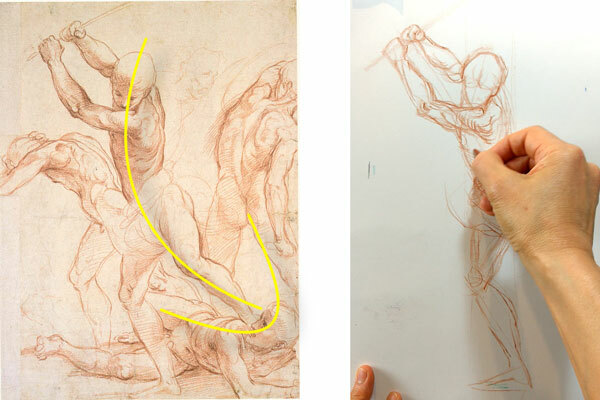 Raphael repeated a few lines in one area to achieve the right curve. So don’t be afraid to adjust your lines this way. Just avoid tentative heavy lines. Make light, swift lines, then accentuate them with a strong line where necessary. The lines seamlessly serve multiple functions – shade, form, movement, feel of muscle, bone and anatomy. So while we initially thought it was just a matter of drawing bigger to match his hatching, we realised his hatching is incredibly intricate and effective, and we’ll probably need to study it much more to truly understand how it works. 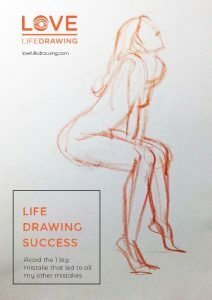 Thanks for reading – don’t forget to check out our free guide to Life Drawing Success and sign up for our newsletter below.